Time was that going to the movies was even simpler than it is today – once you parked, you didn’t even have to get out of the car. 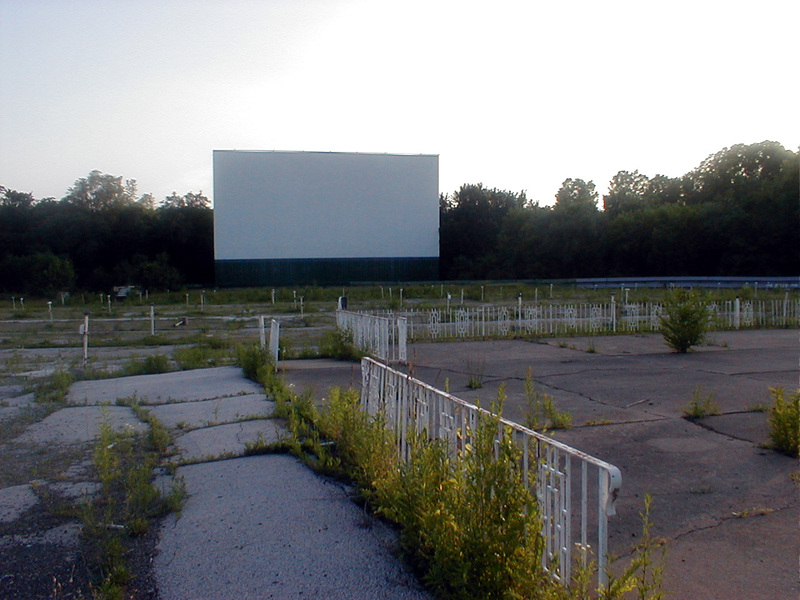 Drive-in theaters in general have seen better times, and so has this one. In June of 1933, Richard Hollingshead’s grand dream opened in Camden, New Jersey. 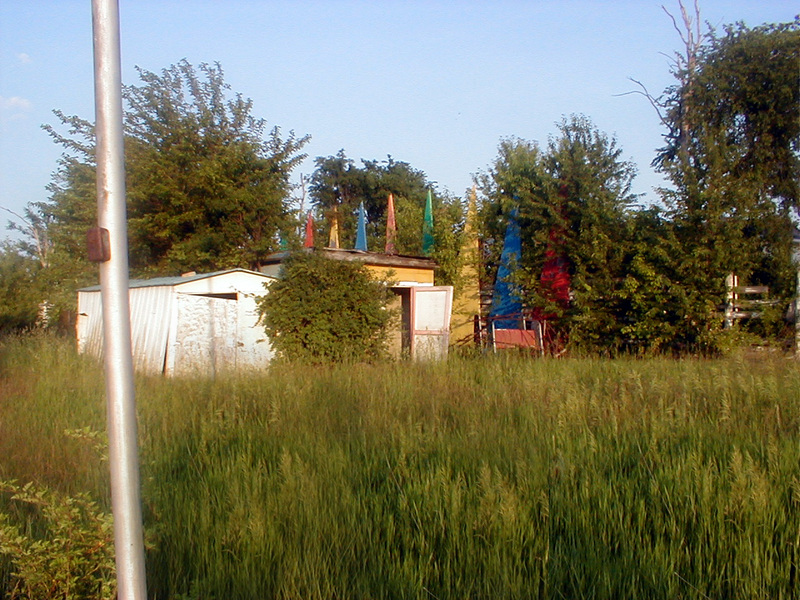 Over the previous few years he had tried out various ideas on his friends and slowly developed what would become the drive-in theater. At one point he actually nailed a makeshift screen to a tree and balanced a projector on his car to decide what times of day and from what angles a screen could be seen outdoors. Richard’s idea slowly gained popularity, but in the late 1940’s the phenomenon exploded across the American landscape. Fueled by new cars and wallets full of post-war expendable income, soon it seemed wasn’t a town or county without one. In this environment, competition was fierce; operators were always seeking to one-up their nearest rival. Simple concession stands gave way to roving bands of carhops, which gave way to huge rolling “buffeterias” loaded with hot dogs, popcorn and cheese sauce. Small playgrounds opened for the children, which led to miniature golf courses and then to ride carnivals steps away from the family wagon. 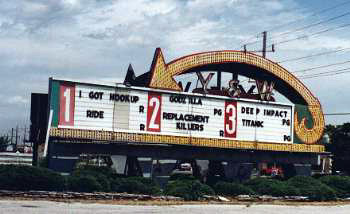 Many theaters turned into family entertainment complexes. In Indiana, the theater count swelled from none in 1940 to over 120 in 1958 – more than 1 per county. Unfortunately, it didn’t last. First, air-conditioned theaters drew customers from those hot parking lots. Next, televisions started competing for free time, especially as the programming improved. Improvements in movie sound quality didn’t translate well to the small speakers in the car and VCR’s and cable TV brought movies into the home. The last blow was competing uses for the large tracts of land as the inner-ring of suburbs close to large cities began to run out of space. 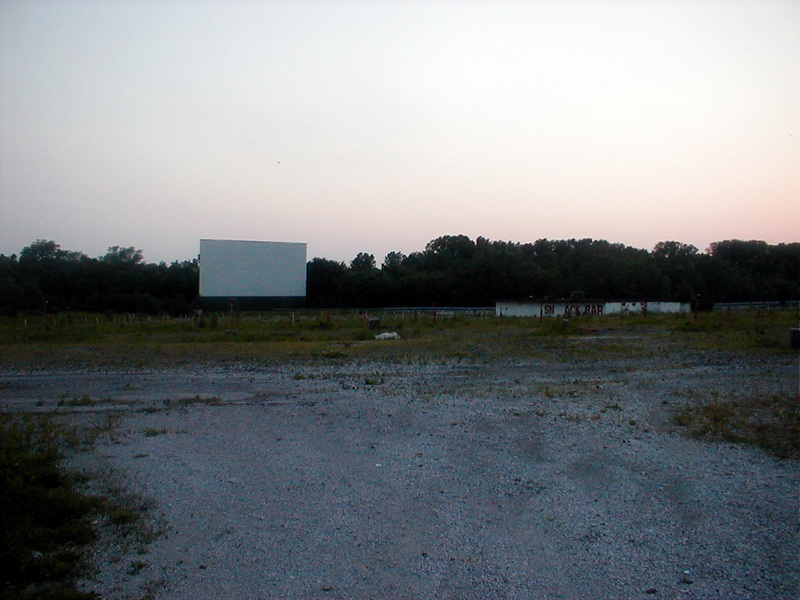 To this day, many of the drive-in theaters that close do so because a developer seeking to build a new shopping center or apartment building makes an offer too good to resist. The south fence line of the property. The Y&W Drive In, also known as the Lowes Y&W and the Sony Y&W sits on a very busy stretch of South Broadway in the middle of Merrillville, IN. Merrillville and its next-door neighbor, Hobart, became a tony destination for those fleeing Gary in the middle 1960’s during the height of suburban sprawl. The giant Southlake Mall on US 30 (part of the old Lincoln Highway ) near I-65 became the trendy place to spend time, and the traffic patterns out of Gary lead one right past the Y&W. 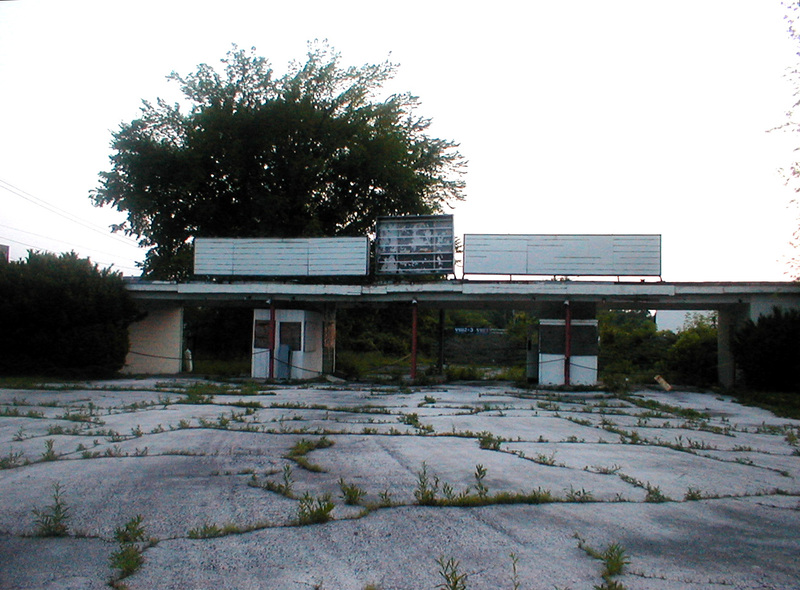 No doubt it was a great place to spend the evening for any family living in Northwest Indiana. The theater closed only a few years ago, which means that most its buildings are in good shape. However, the site is not secured in any way – one can drive right off-Broadway and into any one of the three theater areas. The facility is on the west side of Broadway. 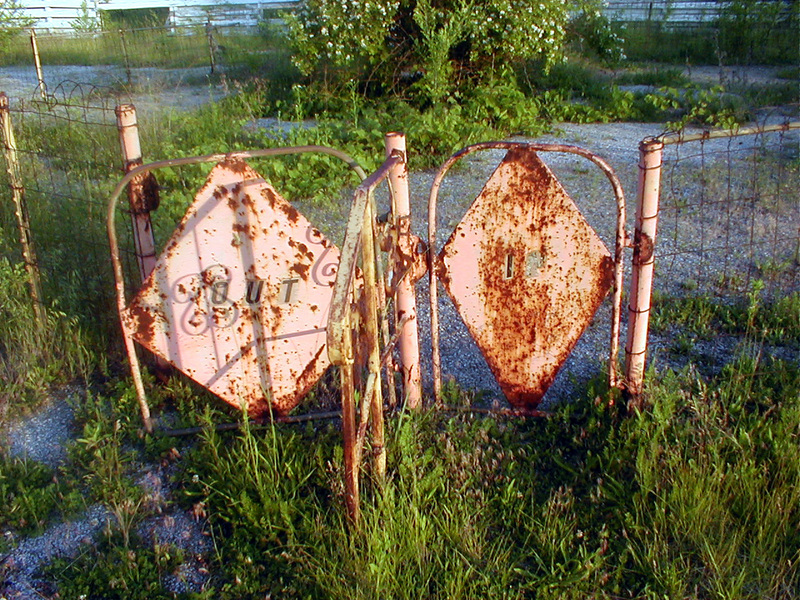 One enters the property by driving past the north side of the sign. The road curves immediately south and then to the west again, where a ticket booth gate stops you. The booths themselves are simple wooden structures, but looking inside them reveals beautiful block glass ticket windows. Workers might have built the wooden walls hiding them at a later date. Driving across the property. The building straight ahead probably once served as the owner’s home and office. The hidden ticket booth. Click for a larger picture. 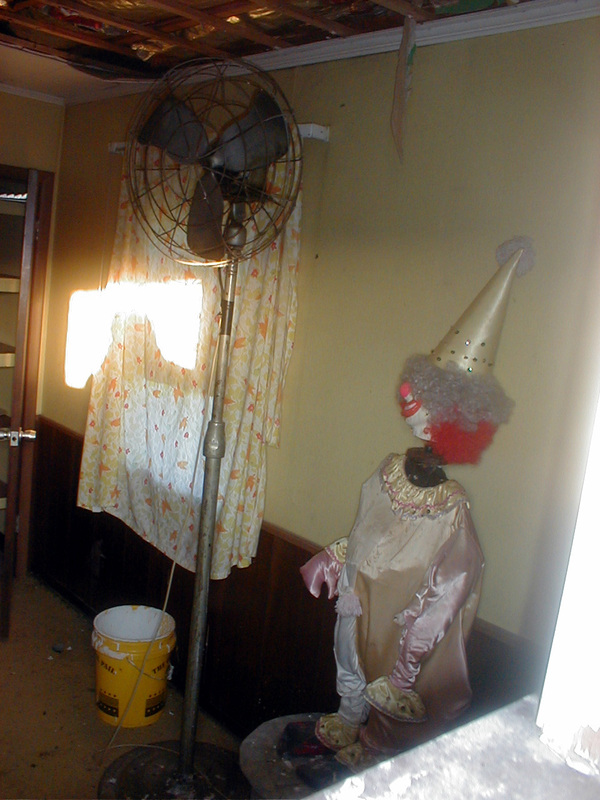 This scary clown inside the front building. Just past the ticket booth is a huge sign that indicates those going to “Y&W 1” should stay to the right, and those going to “Y&W 2 & 3” should stay left. 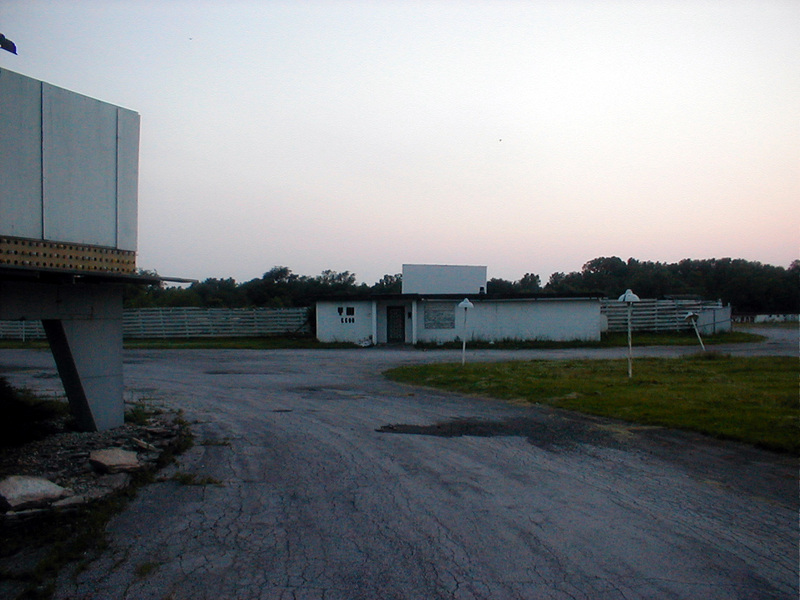 The left hand road continues along the south side of the property, turning north along the west side of the property, to deliver cars to the front of the theater parking areas for screens 2 and 3. A quick right turn for those going to theater 1 deposits you at the front of that area. Theater 1 is clearly the largest, and has both the largest concession stand as well as the remnants of what once was a playground area. 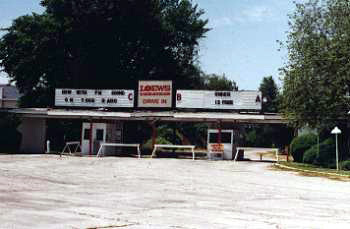 Theater 3 is in the most disrepair – the weeds here are higher and the screen’s white paint has severely peeled away, indicating the owners probably shuttered it first and continued to use the other two for a time. 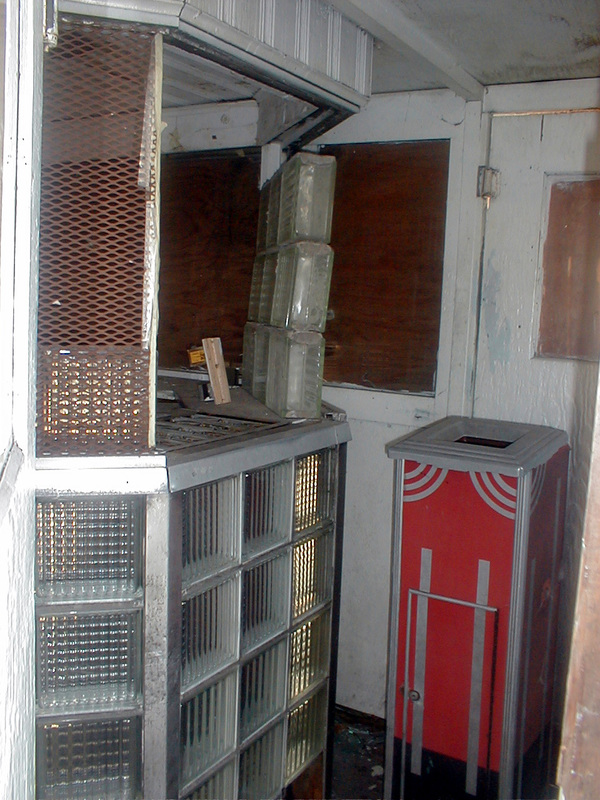 A board is missing from a window on the front of the concession stand, allowing one to look inside but not to enter. 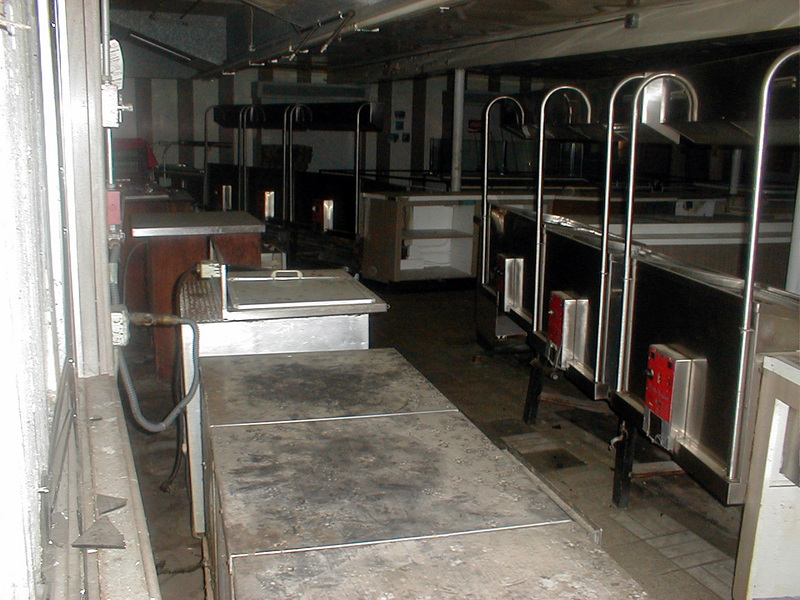 The concession area was clearly a major operation with several simultaneous serving lines and restrooms in the back. There is a small porch area with iron railings which obviously served as an outdoor dining patio at one time. Theater area 2 shares the building. Screen for Theater 1 and the concession stand along the north end. Taken beside the office/house at the entrance. Inside of the concession stand. Taken from an open window on the west side of the building. 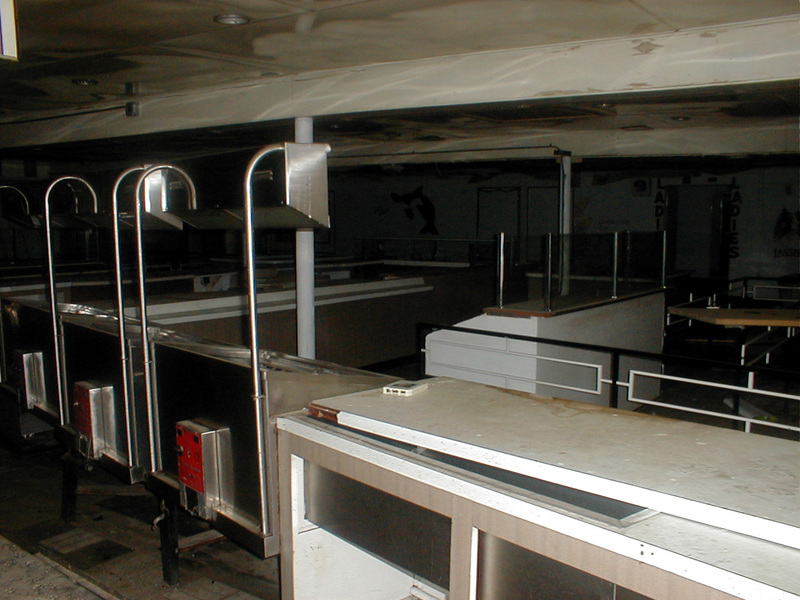 Behind the serving counter, and you can see the restrooms on the back wall. An 8-track tape is on the counter. Facing the screen for Theater 1, looking over the concrete outdoor dining patio on this end of the concession stand. The playground area is the most interesting of all. 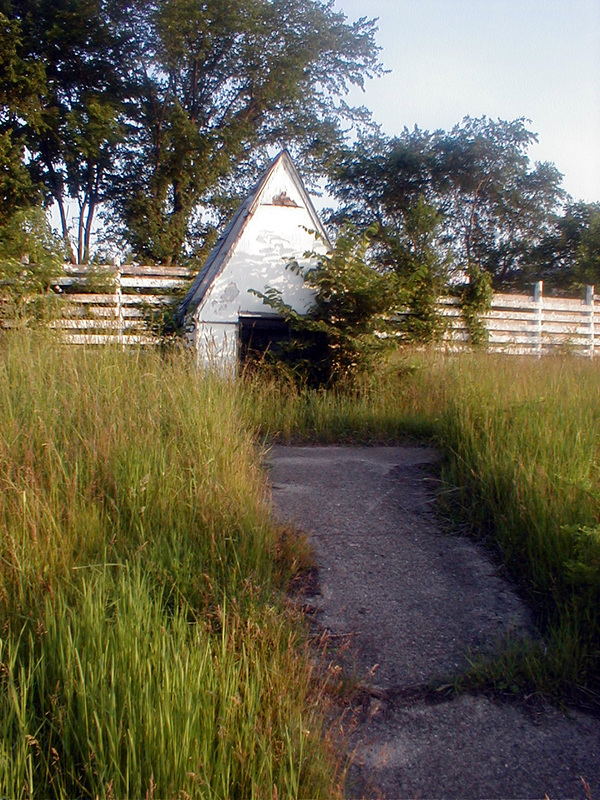 Except for a series of small, curious huts and the remains of a swing set, nothing remains except overgrown hedges, stumps of long-missing figurines, and parts of a carousel. Photo of the playground area and a white storage shed. Gated area inside the playground where the carousel stood. 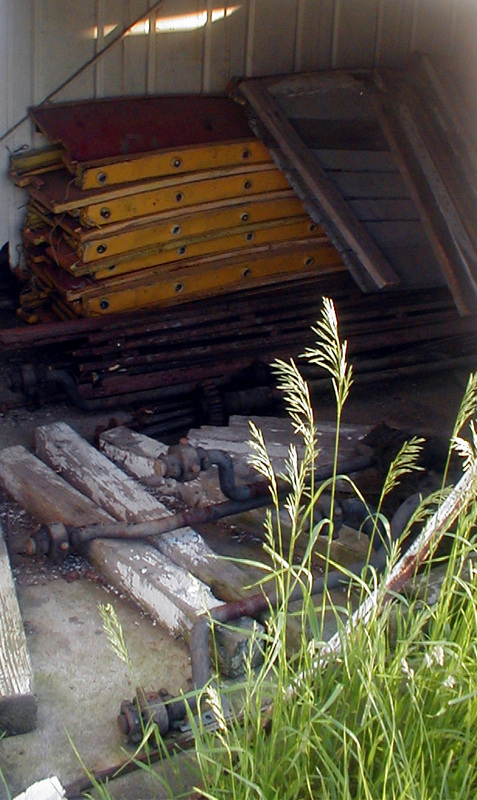 Parts of a carousel stored in the white storage shed. Small building with 3 foot high doors. Holds parts of a lawnmower. Sign in use in the summer of 1998. The same sign as it sits today. The gigantic sign is truly a masterpiece of roadside architecture. It is in very good condition considering its probable age. One can only imagine the scene when this steel monster was lit up at night – you would not be able to miss it for a mile in either direction. Y&W is a good reflection of the current state of so many drive-in theaters. Some continue to see success, but many owners scrape by season to season, deferring needed repairs and holding the operation together for the love of the business. 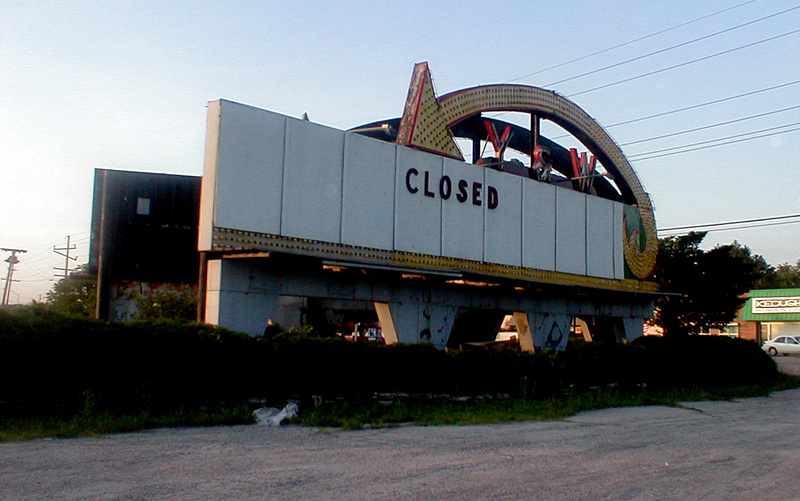 Will all drive-ins slip into the ranks of Lost Indiana? When was the last time you took your family to one? 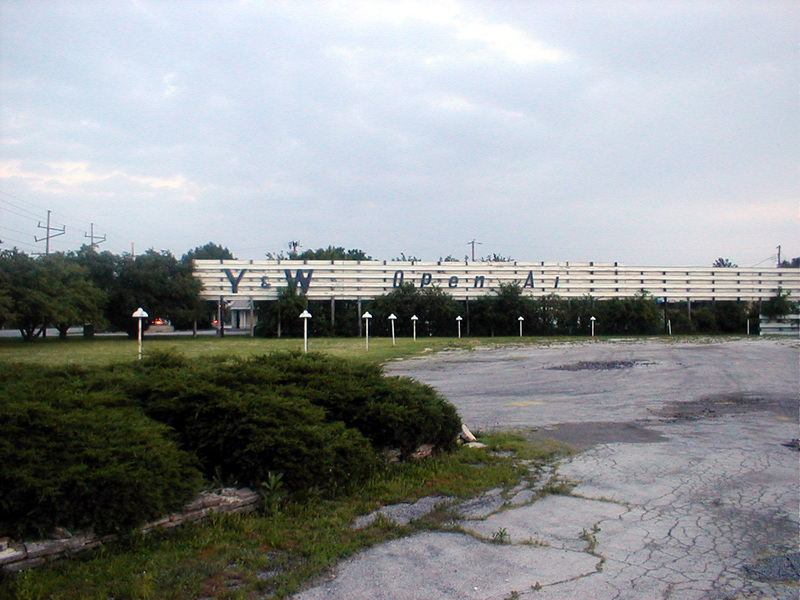 In the fall of 2002 owners sold and removed the Y&W’s sign. 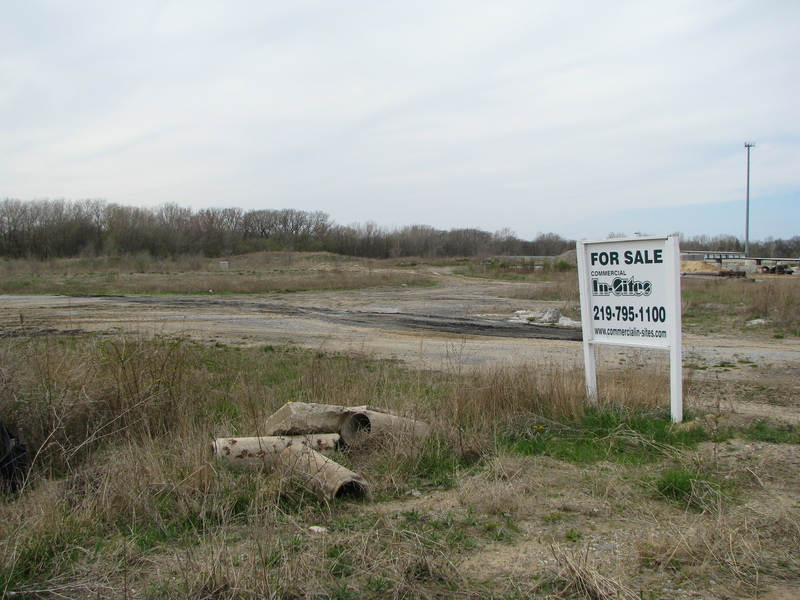 As of April 2009, the site has been completely cleared for redevelopment. 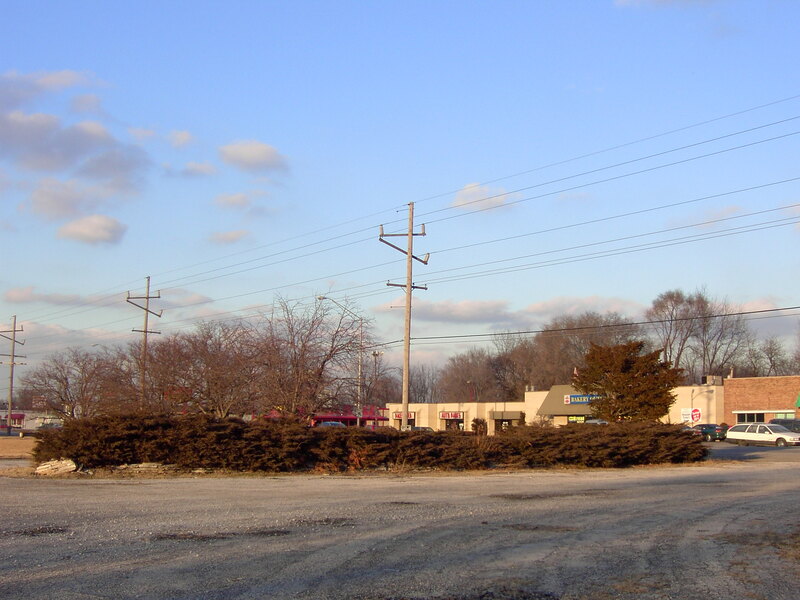 The extreme northern edge of the property has already been reused for a self-storage business. That is heartbreaking, for all of us old folks. If anyone ate popcorn or pizza at Y&W 1 concession stand in 1980 or 1981, I was the one who made it all! My friends and I ALL Loved it, Vincent! Thanks!!! So sad. Great childhood memories. That place used to be packed on the weekends in 70’s. Packed in the 70’s? How about the 60’s! Saw Lawrence of Arabia at 8 years old, The Blue Max at 12, The Green Berets at 13. All us kids would get baths and in our pajamas and head out to the Y&W drive in on Friday or Saturday night with Mom and Dad. Me too saw the Clint Eastwood spaghetti westerns there the James Bond movies. Remember the Easter egg hunts we won one of those giant 5ft. stuffed rabbits. Those were the days. I worked there the summer of ’68. The manager was Steve Kosovar and he had some young honey who managed the girls who worked there. It was a fun summer. Except for the riots in Gary. man..you brought a memory back when i read the words “lucky banko”. i had forgotten about that. i miss the small kiddie carnival area there. there was a round ride you sat in and turned the wheel to spin it until you got dizzy. i miss the pizza they served. remember the old tall man with white hair who wore a dress jacket with a Y & W patch on the pocket…he made all the live announcements and spun music between movies. on summer nights we brought those old crappy fold up lawn chairs and put them up in front of the car….it was just too hot to sit on vinyl car seats in august as we progressed to teen living, putting 6 of your buddies in the trunk of a “das boat” car to save a buck and a half each and watch the movies was the saturday night special. then romance in the car was a right of passage in the 1970’s…a double date with two sisters from highland for me and my buddy max. my last contact senior year was getting the Y & W to buy an ad in our MHS yearbook. I moved on and away allowing the army to let me see parts of germany, korea and saudi arabia. passing by that old stop watching it decline and close and then disappear into fond memories is all that is left. merrillville has become another gary. Ahhhhh yes. Lucky Banko. My only time winning and what does this 12 year old win? A coffee maker. But I will say that my parents used it and it lasted over ten years so at least it wasn’t a cheap prize. My first visit was in early 1976 with my dad and we saw the movie “Lucky Lady” with Burt Reynolds and Gene Hackman. I was so in awe of the place and enamored by it that I would have liked any movie we were seeing. Turns out I watched it again about 5 years ago and it is truly an awful movie. The second feature was a comedy called “Rafferty and the Gold Dust Twins” with Alan Arkin, Sally Kellerman and Mackenzie Phillips. I don’t remember anything about the movie save for that we left halfway through it. I have never seen it on television or video since and I would love to watch it now. My favorite memory was in the spring/summer of 1977. Dad and I went to see a re-release of “Young Frankenstein.” We were in Y&W #1 and above the screen and wayyyyy out in the western skies was lightning that lasted through the whole movie and really added to the atmosphere. I spent many a night at the Y&W (nothing beat the triple feature my best friend and I saw in 1986 of “The Fly,” “Aliens” and “Fright Night”) including my 21st birthday where my best friend and I proceeded to get so drunk we couldn’t remember anything about the two movies (“Remo Williams” and “At Close Range”) the next day.